Location: Appears throughout Hyrule, coming into conflict with Link near dungeons in particular. 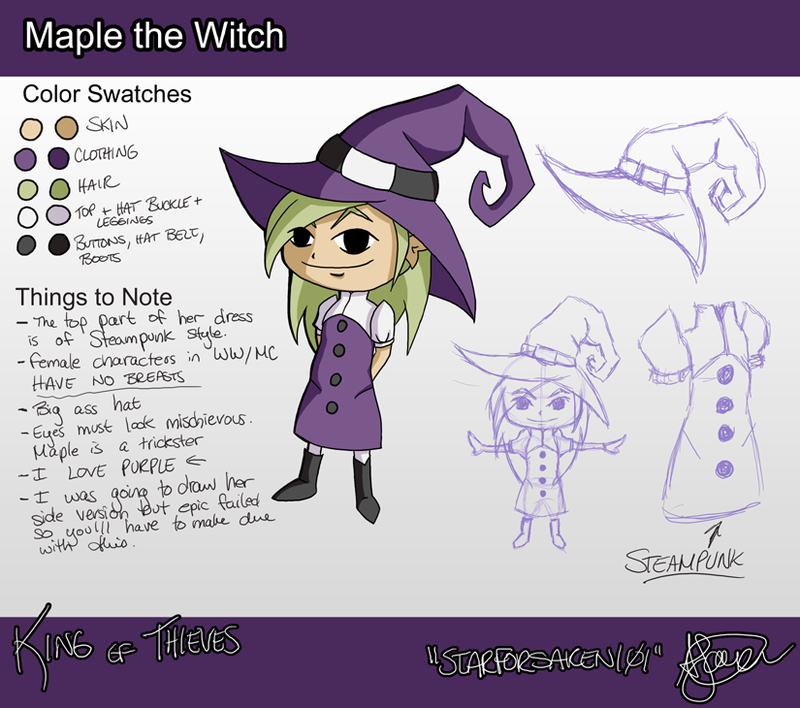 Description: Maple was once the witch Syrup's apprentice. She displayed natural talent toward casting spells and flying a broom, but potions always gave her problems. Maple eventually convinced herself that if she couldn't prove herself to be a potions master, Syrup would be disgraced by her. One day while Syrup was out, Maple attempted a very difficult potion and ended up destroying Syrup's potion shop. Before Syrup could come home, Maple ran away. Some time after running away from home, Maple somehow met the Hero's Shade. Needing help to get the Cogs from the dungeons before Ganon could, the Hero's Shade enlisted Maple's help, emphasizing that the cogs would enhance her magic and allow her to master potion making. Link first encounters Maple as they both head toward the Wind Cog, and they bump into each other competing for the cogs throughout the first three temples. Maple's story concludes somewhat at the end of the Goron Dungeon. After teaming up with Link to defeat the boss, Maple swoops in and grabs the cog before Link can. But before she can escape, she thinks better of her selfishness. She realizes that before she started hunting cogs, she never would have had the courage to face that monster and realizes that even without the cog's magic, she's grown. Before turning the cog over to Link though, she uses the monster's venom and the cog's magic power to synthesize and antidote to the Goron's sickness, then hands it and the cog over to Link, saying she needs to go check back in with someone. Later, Maple can be found in Syrup's potion shop, finishing her witch training. Maple is also a regular contender at the Pawn Shop's Thieves race. And she likes to swoop in to steal dropped items when Link leaves them too long in the field. This page was last modified on 29 August 2015, at 19:37.